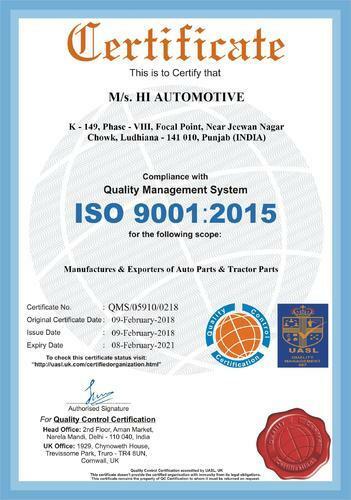 Founded in the year 2014, we “Hi Automotive” are a dependable and famous manufacturer of a broad range of Centre Bolts, U Bolts, Spring Pins, Spring Bush, Cotter Pin and Metal Bushes. We provide these products in diverse specifications to attain the complete satisfaction of the clients. We are a Sole Proprietorship company which is located in Ludhiana (Punjab, India). Offered assortment is immensely appreciated for features like durability, easy installation, high strength, sturdiness, corrosion resistance and fine finish. Under the supervision of “Mr. Puneet Marwaha” (Proprietor), we have gained huge clientele in our country.